the_apprentice wrote: Shucks, thanks for the kind words guys. I finished this months ago and I've been so excited (and a bit nervous) to release it. I have to admit that I shirked the perforating duty, so spare a thought for Perforating Pixie Steve! I love the colour changes for each of the different sections of the sheet and, if it's not stampy heresy to suggest, wouldn't mind seeing even stronger colours used in the future - like Squigglyx, I have been known to put my favourite (spare) sheets in a frame on the wall. In this case it will be a UUFO . . .
Re the cataloguing - I agree with Carol, I'd be inclined to list both the sheet and the individual stamps . . . even though the thought of splitting up my sheet puts me in a cold sweat, I'm sure someone will do it! Ian deserves a round of applause for such a bold idea. Seriously though, this was very adventurous and difficult to achieve. Well done. Muba wrote: Ian deserves a round of applause for such a bold idea. Real scrumpy does not get made in a factory. You visit the farm and get it in a plastic container. Next day you have no idea what farm it came from or even what you were doing. 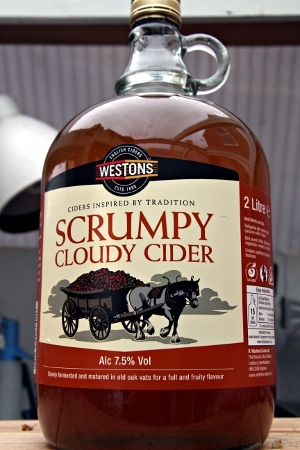 For real scrumpy there is no next day, just a blur.